Viennese cuisine is hearty, heavy, and flavorsome! Loved the Goulash, Brats, Wursts, Leberkasse, and potatoes cooked every which way. Our Swine and Dine Club had it's beginnings here and we pay homage to the Pig. 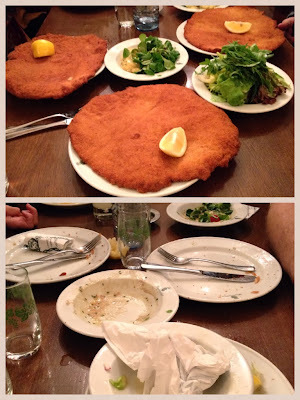 "Wiener Schnitzel and its Italian counterpart, Cotoletta Milanese, involved two Hapsburg domains in a culinary quarrel. Both branches of the family, Austrian and Italian, claimed credit for the invention of the dish, the latter branch tracing their claim all the way back to a banquet given in 1134 for the canon of Milan's St. Ambrogio Cathedral." 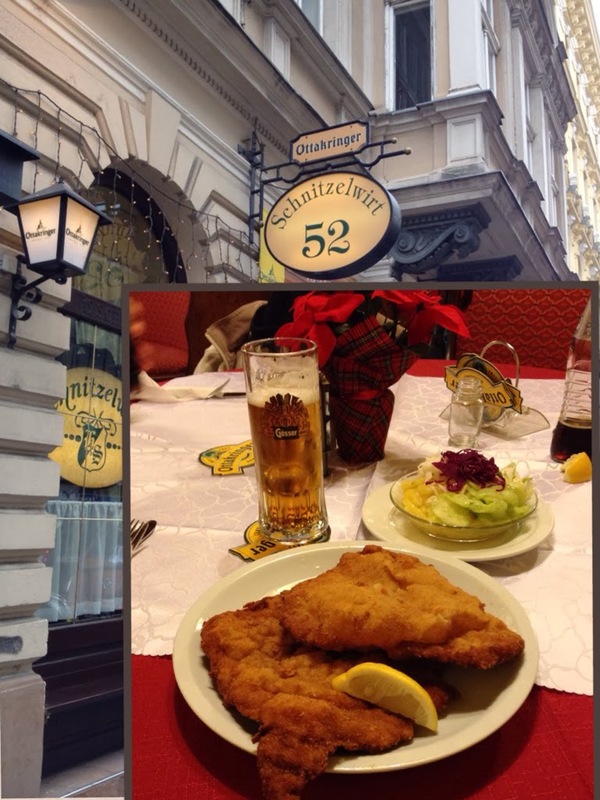 We had to test the claim for the best Schnitzel in Vienna from many travel guides and friend Joe Popp. Figmuellers definitely had an overflowing plate - at least the salad was healthy. The after picture should tell you what we all thought. Hanging out at Bitzinger, the best Wurst at a stand outside the Opera House - I am singing an Aria over this dog! At a food booth in Spittleberg with nephew Trevor, daughter Ren, and Ren's buddy Ali. They are eating what is called an Erdapfelpuffer - a garlic infused Potato pancake is the only way to describe this delectable treat! In between the pig, we stopped at many of the famous Coffee Houses in Vienna and had wonderful coffee and desserts. 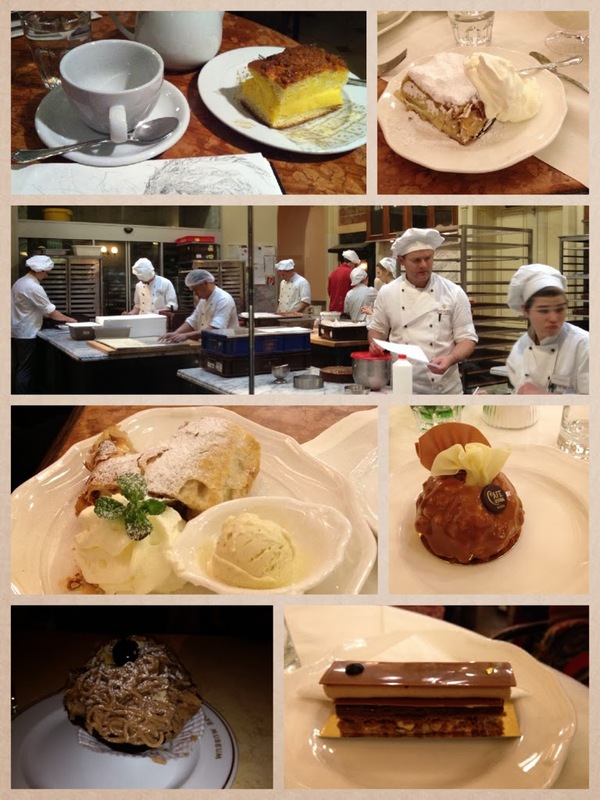 Demmel's shown above has many pastry chefs working on the famous Vienna Apfelstrudel. Famous Cafe's also pictured with some of these wonderful desserts are Cafe Sperl, Cafe Mozart, Cafe Central, and Cafe Landtmann. Back to the Pig and another Schnitzel trip - this time to Schnitzelwirt - gotta keep working on where to find the best Schnitzel in Wein. 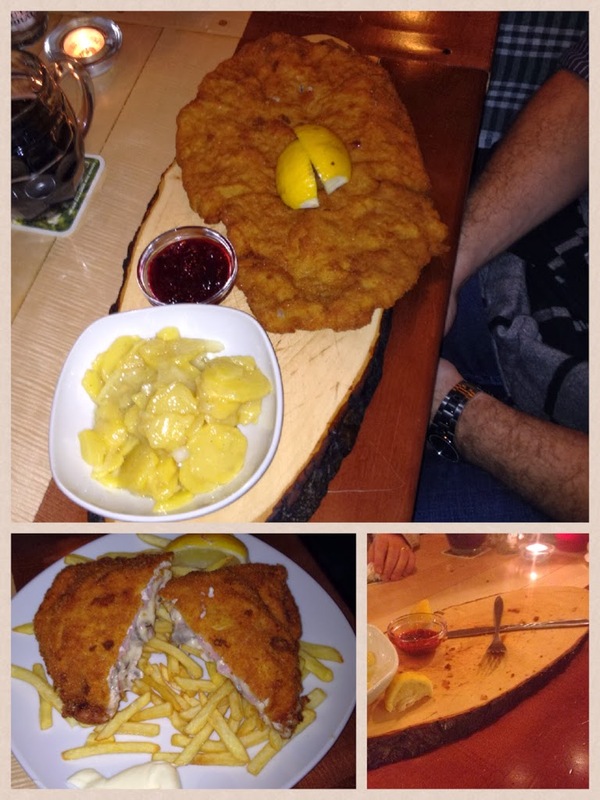 We sampled the traditional schnitzel along with the mushroom cordon bleu schnitzel at the Plutzer Brau in Spittleberg. This is one of the favorites. Rich was tired of all the Schnitzel, so he decided to attack other parts of the pig. Pork Ribs at the Centimeter - a busy hangout in our neighborhood. With so much Schnitzel being consumed, there had to be good ribs around - he was right as usual when it comes to food! After eating probably 50 lbs of pork, we all finally decided on a winner for the best Schnitzel - Brezlg Wolb. A suggestion from Laura Mitchell, a long time local. Renata and Victoria spent New Year's Eve with the Viennese locals - what they did they would not tell us! Our last night in Vienna was New Year's Eve. The Viennese know how to celebrate!! There were not only public displays of fireworks, there were also individual pyrotechnics displaying their skills throughout the city, it was like a war zone that ended with a Danube Waltz! Vienna - Danke und Auf Wiedersehen! !